Dr. Jart+ Ceramidin Liquid ~ sample size pictured (full size is 5 oz for $49.00). This liquid skin saver plumps and seals dull, dry skin for all day moisture. The serum acts as a liquid cushion that strengthens and protects skin barrier from chronic water loss with the power of ceramides. It transforms rough and dehydrated skin into a hydrated, healthy glow. 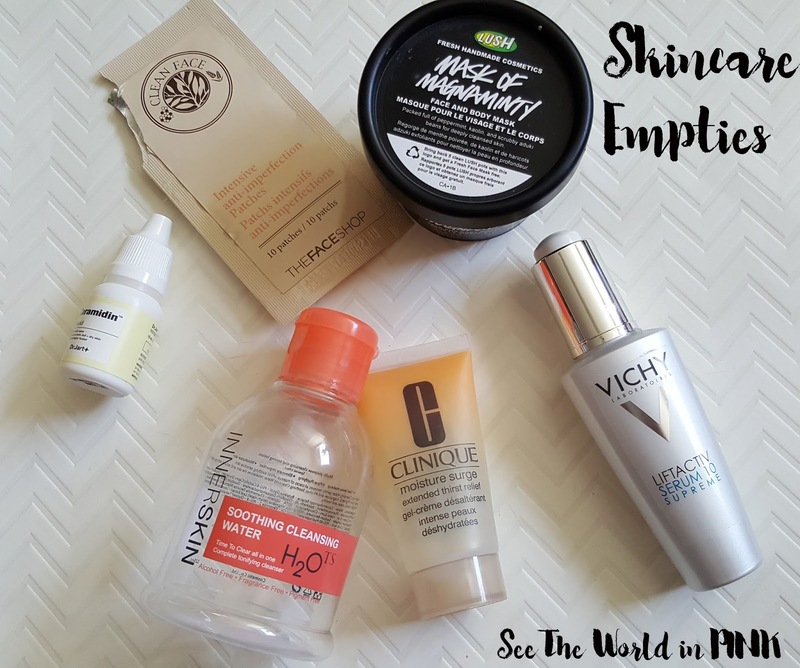 I received this serum quite a while ago in a past Birchbox and quite liked it - I did a review of this on a Skincare Sunday post here! I did like this and thought it added a lot of moisture to my skin; I'm just not sure if it was fantastic enough to repurchase. Inner Skin Soothing Cleansing Water ~ $9.90 for 125ml. I used just as I would use my Bioderma - makeup remover for my mascara and eyes and a quick rinse over the rest of the face. I do follow up with a cleanser. This was good - just not as great as the Bioderma. Clinique Moisture Surge Extended Thirst Relief ~ sample size (full size is $13.00 to $61.00). A multitasking, lightweight cream-gel that provides up to 24 hours of soothing hydration. I received this quite a while ago and went in and out of using it - it was okay, but I did not find it as moisturizing as promised, I found I always had to pair it with another moisturizer. Vichy Liftactiv Serum 10 Supreme ~ $57.00. Vichy’s breakthrough anti-aging serum featuring Rhamnose to slow the signs of skin aging. In just 10 minutes, see visibly firmer, smoother skin. Shown efficacy on the appearance of wrinkles, pores & radiance. I featured this mask in a Skincare Sunday post - you can see a full review here! I did like the formula of this serum and it pretty much became my everyday serum! 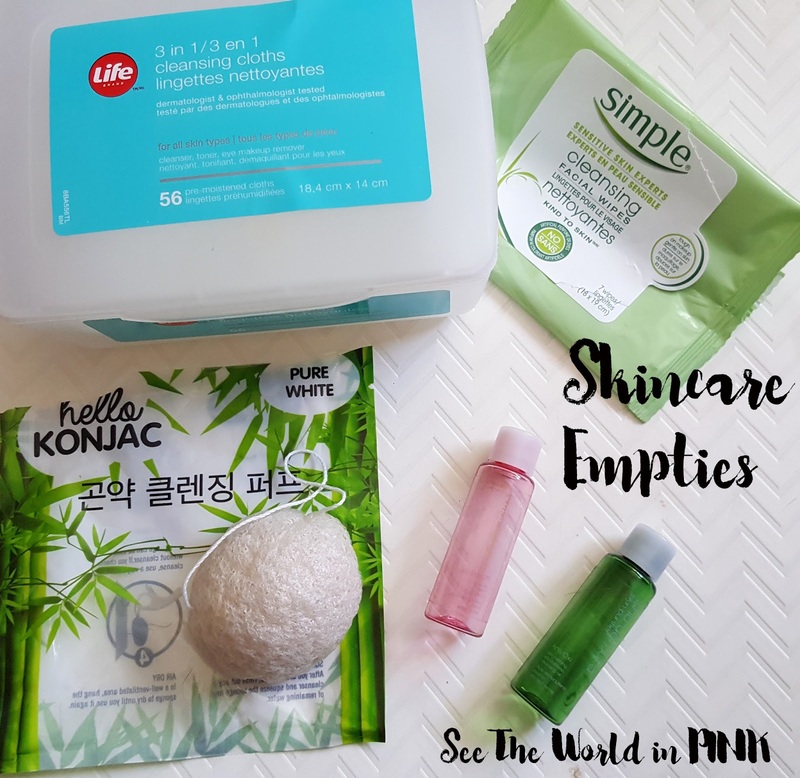 I did not like the packaging though - it had a dropper type bottle and I just did not like it; it was so hard to get any product. These worked well - I mostly use these for makeup swatches, etc. I rarely use them as full face wipes. They worked well. Simple Kind To Skin Cleansing Facial Wipes ~ $8.27 for 25 (I had a package of 7). Our Cleansing Facial Wipes refresh and nourish your skin plus remove waterproof mascara. 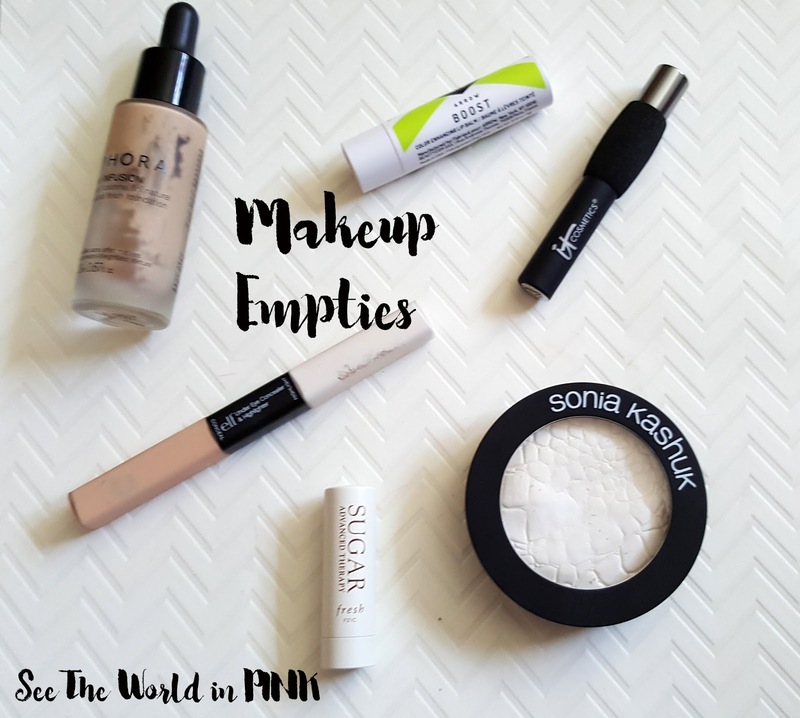 I didn't think that these worked great on eye makeup in general, but again I rarely use wipes for eye makeup as I find they pull too much. These worked well for everything else. I received this in a past Fab Fit Fun box - these sponges are supposed to be replaced everything 3 to 6 months and I hung on to this one for a year. I didn't use it much close to the end and was reminded to toss it when I received a new one! Shu Uemura Porefinist Anti-shine Fresh Cleansing Oil ~ sample size 15 ml for $3.80 (full size is 150 ml for $38). An incredibly lightweight cleansing oil that leaves the skin clean, fresh and refined. With the expertise in cleansing oil for half a century, our beloved fresh formula is powerfully reborn to target the source of oily concerns. The water-like cleansing oil goes beyond make-up removal to dissolve and wash away excess sebum and blackheads that are stuck inside pores. No pulled or parched. The new formula, with cinnamon bark extract, regulates sebum secretion day after day. Shine is blotted and open pores appear shrunken. Blackheads are removed to reveal a refined, smooth skin. This was a decent cleansing oil - I didn't recall it working as anything special on my blackheads or anything, but I didn't mind it. Shu Uemura Anti/oxi Skin Refining Cleansing Oil ~ sample size 15ml for $4.40 (full size is 150 ml for $44). Anti-pollution power blows away dull, yellow look. The innovative combination of moringa extract and green tea extract creates a result of glowing clarity and refined smoothness. shu uemura introduces the innovative anti-pollution power of Moringa extract. Combined with legendary anti-oxidative Green Tea extract, it instantly captures and clears pollutants that accelerate aging stress. It's our no.1 cleansing oil, reborn. This also came in the Shu Uemura Topbox - it again worked well, but was nothing amazing for the full price. Shaving Emulation Lotion by HelloLegs ~ $19.95. Step up your shaving game! 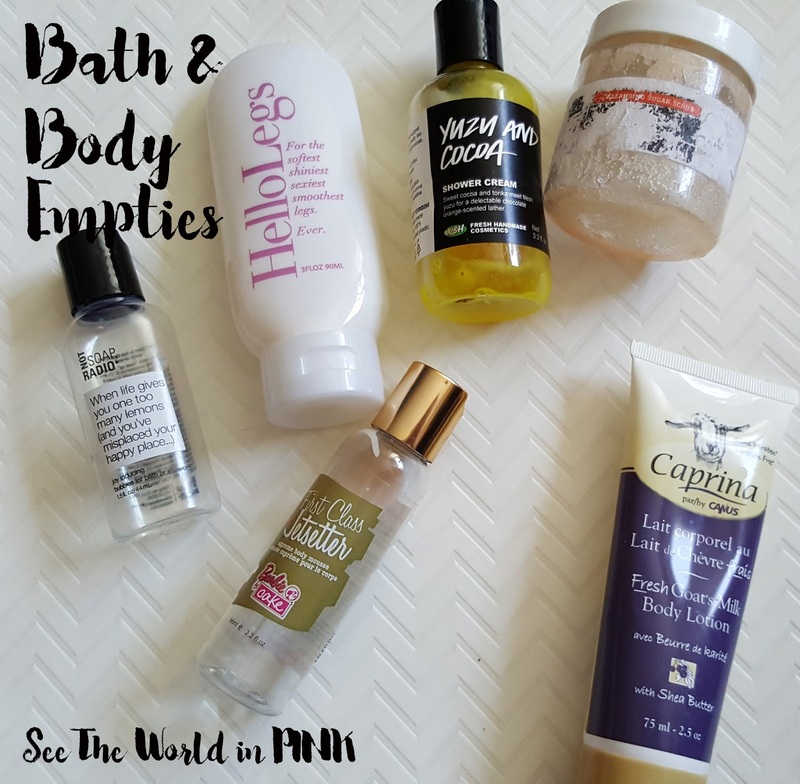 The folks at HelloLegs combined the richest body lotion with the most most gentle of shaving creams and added a bit of "blade butter" to the mix to give you a smooth razor performance you've never had before. Yup, this little bottle is about to shave your life. Repurchase: I would prefer to receive it from somewhere again! Lush Yuzu and Cocoa Shower Cream ~ $9.95 for 100ml. This one's packed with enough cocoa and tonka to make Mr Wonka wish he'd invented something half as sweet. Citrusy fresh yuzu juice is blended with reassuring cocoa and tonka absolutes for a shower that smells like chocolate oranges. You might not be able to lick it, but with a scent this sumptuous your comfort eating cravings are sure to be satisfied. This smells so good - chocolate oranges is the perfect way to describe it! I used this as both a foaming bath gel and a shower wash. I love the formula - they are nice and hydrating! Bath Time Box Citrus Clean - Cleansing Sugar Scrub ~ $8.50. This cleansing, refreshing scrub is gentle enough for the whole body. Gentle castile soap blended with skin loving olive oil, botanicals and an energizing citrus fragrance. The scent of this sugar scrub is amazing - it is orange with a hint of cimmamon in it! This worked really well and I liked it! I liked the scent and packaging of this body wash - it was bright and lemony! I used this more as a bubble bath than a body wash. It was good. Barbie by Cake - First Class Jetsetter Supreme Body Mousse ~ $??. From Paris to London and New York to Malibu, be like Barbie and travel in style. This scent is the most amazing cake scent ever! This came in a special edition set by Cake Beauty. I wish I could find it again, but I have not been able to! I actually prefer the hand lotion over this body mousse - I didn't find this the most moisturizing. Repurchase: If I can ever find it again! Caprina Body Lotion Shea Butter ~ $3.99. Caprina body lotion contains fresh goat’s milk, a natural and highly effective skin moisturizer. Shea Butter is a plant lipid which is recognized for its excellent emollient properties. Plant lipids such as Shea Butter can be very helpful in hydrating and maintaining skin elasticity. You will love the calming fragrance! Caprina body lotion is non-greasy, absorbs quickly and helps restore your skin’s own moisture levels for 24 hours. This lotion is amazing - I can't believe that I have passed this lotion over in drugstores before. This formula is thick and moisturizing and the scent is great! Arrow Boost Color Enhancing Lip Balm ~ full size $18. Between running things at the office, running errands, and trying to hit the gym (to run some more), we usually find ourselves running low on time. Enter: this high-tech, moisturizing lip balm from Birchbox brand ARROW. Formulated to adjust to your unique pH, it enhances each wearer’s natural lip color to create the perfect, just-for-you hue. Nourishing ingredients like mango seed butter hydrate and protect lips, and the lightweight, subtle formulation allows it to go wherever you do—from pre-work yoga to a lunch date to happy hour. Another perk? It boasts a lovely minty scent. Like all products in the ARROW collection, it is vegan, paraben-free, cruelty-free, and gluten-free. This was a Birchbox brand product - it is supposed to change your lip colour. I didn't mind it, I did find it hydrating, but I didn't like the bright pink colour it turned my lips. IT Cosmetics Hello Lashes 5-IN-1 Mascara ~ sample size (full size is $24.00). When’s the last time your lashes were so noticeably long and luxe, you could wave hello with them? It’s time! This game-changing bestseller is your volumizing mascara, conditioning lash primer, lash-enhancing serum, lash tint and curler—all in one! While the triple-action brush lengthens, curls and separates your lashes, the innovative lash ball detailer tip lets you Go Vertical™ and is designed to reach every last inner and outer corner lash. No lash is left behind! This brush is interesting - it is hard plastic type, and has 4 different sided bristles with a starburst bristly thing on top. I liked the mascara formula, but I was not a fan of the brush. Blah. I'm sure some people love those types of brushes but they are not for me! e.l.f. Under Eye Concealer & Highlighter ~ $3.00. Correct under eye problematic areas such as dark circles and bags easily and effectively! Contains vitamins A & E, chamomile, caffeine and green tea to moisturize, soothe, and tighten the skin around the delicate eye area. Blends in easily and evenly to provide a smooth and natural finish. This formula is really thin and the highlight shade doesn't do much. It was inexpensive but really not worth it. It just didn't offer coverage or do a whole lot. I received this sample in a Sephora order and this is amazing! Now, I have lip balms I love, but this treatment offers so much hydration! My lips feel soft and smooth for so long! This works really well to repair lips and I now use this every night before bed! I loved this - it was also featured in my July Favorites. Sonia Kashuk Chic Luminosity Glow Powder~ $12.99 US. Sonia Kashuk Chic Luminosity Glow Powder introduces a new illuminating formula that perfectly captures light for a smoother-looking complexion and lit-from-within glow. The croc-embossed pressed translucent powder combines the best features of baked, powder, cream and fluid formulas to awaken and refresh the skin for a bright, naturally polished finish. I got this earlier this year during my big US shopping haul. I love luminosity powder, to lightly dust all over my face after foundation. This one is garbage - it actually does nothing. The powder barely came off on a brush at all. Not good - this is a toss; I tried so many times to make it work! Bath & Body Works Black Cherry Merlot Deep Cleansing Hand Soap ~ $6.50. An addictive blend of dark cherry, black raspberry and sumptuous merlot. These are usually my go-to hand soaps for all the bathrooms in my house. This scent however, reminded me of cough syrup - I didn't like it. But I did have a guest use it and tell me it was their favorite scent. Repurchase: The soap, yes; this scent, no. Cutex Nail Polish Remover ~ $4.00. I don't like this kind - I really had to buy it because I could not find the Joe Fresh kind at Superstore that I really like. This one didn't have any type of control top and I hate how much comes out even when you just need a tiny bit. Blah. Repurchase: Hopefully I don't have to. This is great - I like that it is a deoderant and an antiperspirant in one - I use nothing else. Also another exciting product - I wear contacts and this is the only contact solution I use. Joico Shampoo and Conditioner Liter Duo Set ~ approx $57 for set. To repair damage. I usually purchase this product from chatters and they usually have good deals if you go in store! I love this shampoo and conditioner - it is my go to! I have quite a few others to get through, but I will repurchase this eventually! Klorane Extra Gentle Dry Shampoo ~ $17.29. Klorane has designed this original product to enable you to shampoo your hair without using water. Klorane aerosol extra-gentle dry shampoo with oat milk is easy, quick to use and ideal for people who are busy or on the go. Its cleansing properties come from an original combination of agents with strong absorbent power that acts as sponges to absorb dirt and oil from the scalp. The hair regains its fluffiness in a few minutes and increases its volume. It is also hypoallergenic. A few years ago Klorane was my favorite dry shampoo - this was just okay, I didn't love it or hate it. Maybe it was a different kind I used other than the gentle formula. Revlon Professional Style Masters Modular Hairspray ~ sample size 75 ml for $2.99 (full size is 500 ml for $19.95. Perfect for every day use. This was okay - I wasn't the biggest fan of the spray pump on it. It clogged up and didn't unclog and I did not get to use the entire container up. The hairspray was also just okay - it did make my hair a little crunchy and didn't have the most even spray. 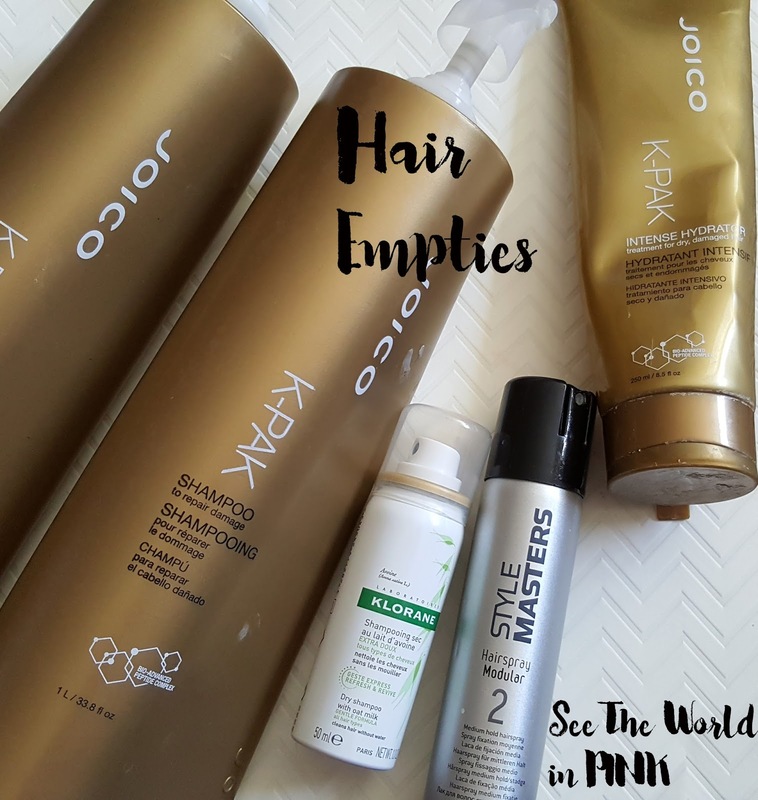 Joico K-Pak Intense Hydrator ~ 8.5 oz for $19.99.There’s dry hair… and there’s hair that’s so parched, so thirsty, so starved for moisture that only a serious drink could bring it back to life. Intense Hydrator is the cocktail of choice: a profoundly nourishing treatment (at a gentle 3.5 PH level), offering immediate hydration to hair that’s gasping for air. I got this quite a while ago in a Nina Garcia box - it lasted quite a while. I liked this deep conditioning treatment and thought it worked really well. I have a back up from buying my shampoo and conditioner and am happy to use it again! Lush - Hand of Friendship Soap ~ $5.95. 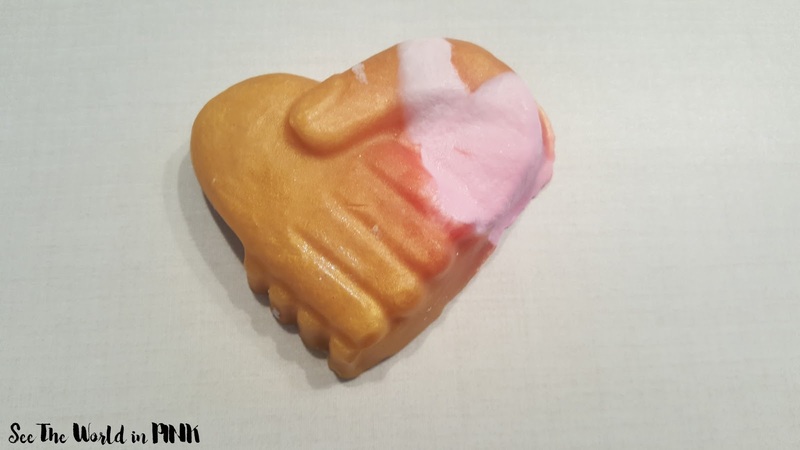 Made with skin-softening coconut and almond essential oils, Hand Of Friendship Soap is a cherry blossom-scented sudser that will help us all share a beautiful message to our new neighbors. For every bar sold, we're donating 100% of the sales to our Friendship Fund, which will help various organizations provide relief to the most pressing needs of refugees arriving in North America. I got this soap a little while ago and thought it was good. I am impressed how long Lush soaps last for. This worked well. This particular type of soap was limited edition. Bath Time Box Mango Papaya Bath Bomb ~ $5.00. Our super-duper bath bomb with the scrumptious scent of mango and papaya, topped off with calendula petals. Perfect to destress after a long day. This bath bomb smells soooo good! 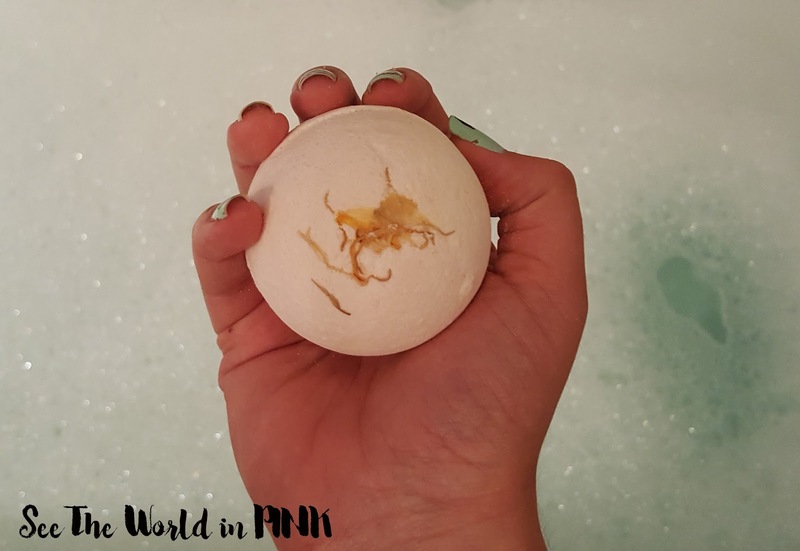 I love Bath Time Box bath bombs - this one lasted for 25 minutes in the bath! It was amazing! Bath Time Box Frozen Margarita Bath Bomb - Super Foaming Bath Bomb ~ $5.00. No summer is complete without at least one Frozen Margarita! 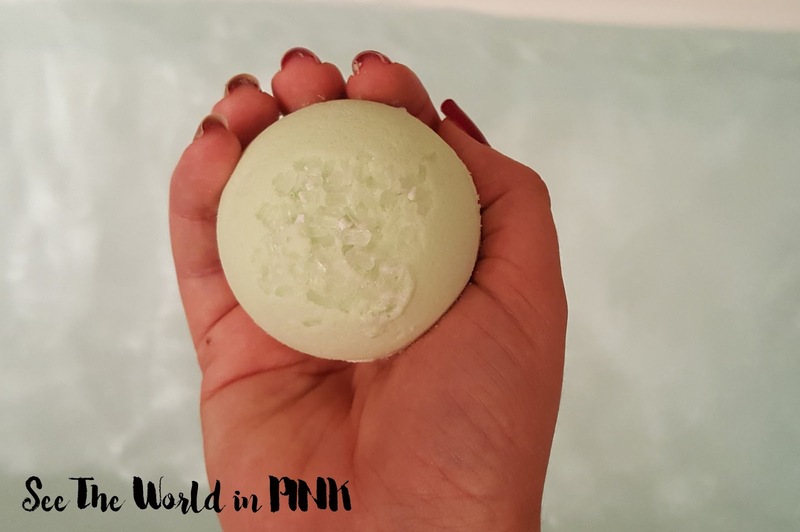 Our super-duper bath bomb is chock full of the bright, sumptuous scent of margaritas - a whole lot of lime and a dash of salt - and topped off with a dash of salt - like all good margaritas should be. Perfect to destress after a long day. This margarita bath bomb also smelled AMAZING. Again, I can rave forever about all the bath bombs from Bath Time Box - I love them! This lasted a long time and worked so good! For September, I used up 35 products! 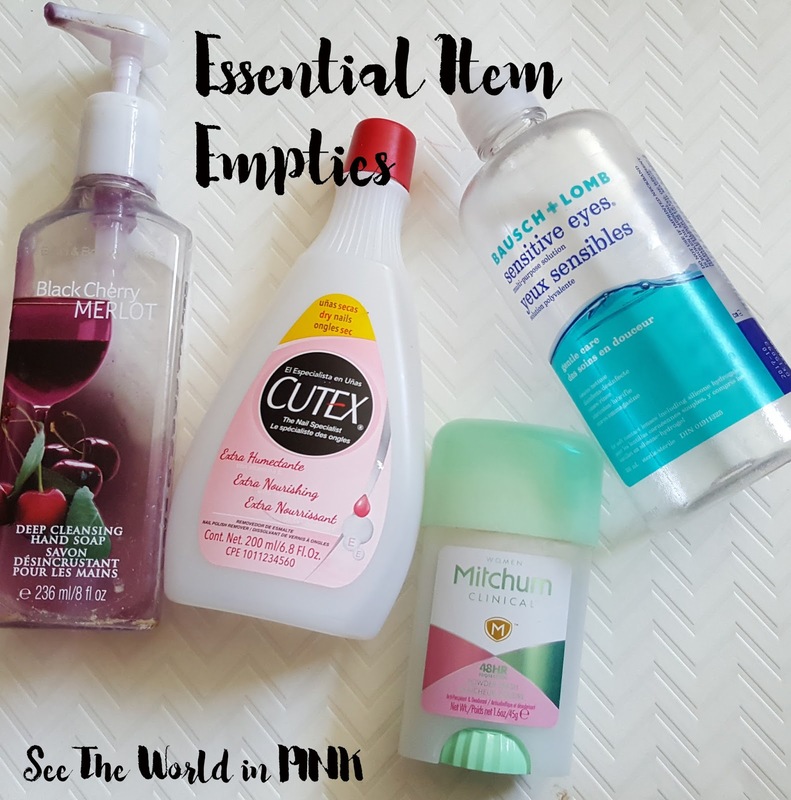 I feel like I have been on a really good roll with my empties every month!